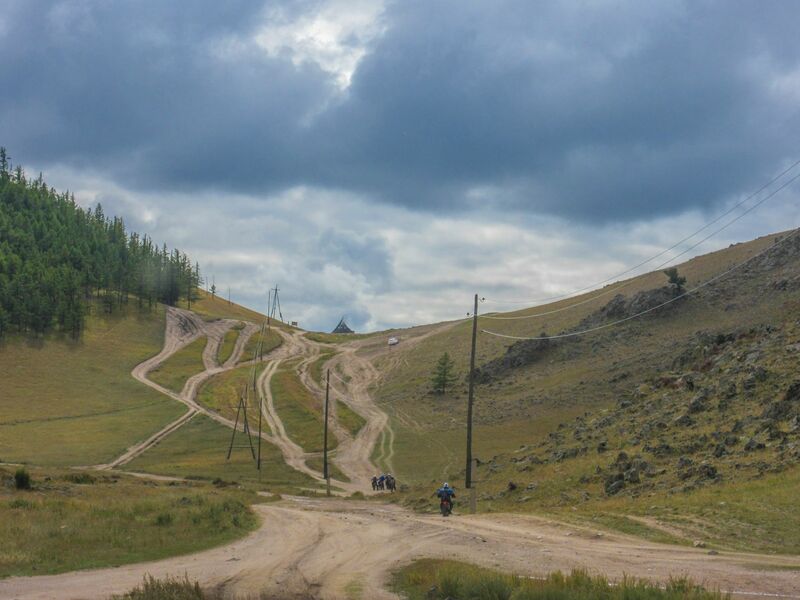 This is a view of the hill climb where I dropped my KTM 450 EXC during my ride to White Lake in Mongolia. In fact, this is the final hurdle. After you climb this pass between two hills you ride down straight to White Lake. As you can see there are many tracks going up. The more a track is used the more it deteriorates. Then people see someone fail to climb a particular track and they use another or create their own. And so on. If you look closely you can see a car towards the top right of the tracks. It had a tough time climbing up but eventually made it across. Our lead rider didn’t think it wise to follow a track that a 2WD car used to successfully climb up the hill. Instead he picked the worst possible track and a couple of us came off our bikes in the bargain. A third rider literally flew off a rock ledge and miraculously managed to land upright. Apart from some scratches on the hand guards of my bike and a bruise to my ego, there was no other damage to me or my motorcycle. But the other rider who fell off wasn’t so lucky. He was riding right behind me and when I fell off he was forced to turn right to avoid going over me. He crashed into a side wall, wrecked the radiator guard and injured his right shoulder. The poor chap couldn’t lift his right hand above his shoulder for the remainder of the ride, but managed to pull along just fine.